Balding and Thinning hair are very common incidences, but they do not really appear the same way for everybody. Balding is a trouble that slowly and steadily becomes acute for both women and men. Hair replacement for women and men has become very popular in UK. At present, there are many hair loss treatments that permit one to deal with with the problem such as remedies, surgery and natural medications. However, every treatment has diverse effects on different people. Also known as PRP, Platelet Rich Plasma Therapy, is a medically proven remedy for hair loss. Suitable for both men and women, PRP is an ideal non surgical treatment for people suffering from alopecia, hair thinning or male pattern baldness. Plasma is a component of blood which is full of healing and growth factors. When applied to areas of hair loss, it helps strengthen follicles and increase the quality and thickness of the hair. PRP will not replace lost hair, but it will strengthen and thicken existing hair. Platelet Rich Plasma Therapy is a specialised, three stage technique. Firstly, blood is taken from the client; it is then centrifuged to separate out the plasma. This plasma is then either injected or infused using a dermaroller into the area to be treated. As your own blood (and plasma) is used, it is a relatively safe technique with very little chance of rejection or reaction to the plasma. We normally recommend 7-10 sessions of PRP, with results being seen after the 4th session. Depending on your individual circumstances, you may need more or less treatments to achieve the desired results. Along with Plasma Rich Platelet Therapy, we may recommend you take medications such as Rogaine or Propecia to expedite and improve results, see our medical treatments page for more information. Nu Hair Clinics offer Platelet Rich Plasma Therapy (PRP) with specially trained surgeons at clinics in London, Liverpool, Nottingham, Leeds and Manchester. Nu Hair Clinic prides itself on being the best group of hair loss clinics with locations in Leeds, Liverpool, London, Manchester, Newcastle, Nottingham and Sheffield. We offer a full range of hair loss treatments across the UK, depending on your individual needs and preferences. We also offer the best hair loss surgeries and best non surgical hair loss treatments in the UK. It is a brand name which is equal to excellence, quality, integrity and care. It is UK’s foremost award winning hair clinic with more than a dozen clinics spread across the breadth and length of UK. The company has 15 years of clinical experience and currently offering the very best results and experience for the customers. In this type the hair growth becomes slow as you grow this reduces the volume and thickness. The hair follicles slowly go in the (resting) phase. This will give you a temporary hair loss from days to months after a strained incident like fever, childbirth, stress, severe illness, or unexpected weight loss, which decreases slowly in a few months. Such kind of hair loss is known as telogen effluvium. Baldness may also take place due to pressure on hair this may lead to tiny, localised areas of hair loss. This kind of hair loss is known as traction alopecia. This baldness occurs when the protected system starts to bother hair follicles, leading to hair fall. This affects to both men and women. It causes loss and thinning of hairs on the entire scalp. Women experience this occurrence as a diffuse alopecia. More than 40% of people get this type of Androgenic alopecia. Male baldness is caused by many factors like genetic influence, where men begins balding at a certain age or at a young age according to their ancestors pattern. We see Men getting bald; they start losing hair and eventually become completely bald. Hair loss is in fact one of the starting signs that a man has been resentful. It becomes hard to bring back baldness however nowadays there are a lot of surgical and Non-surgical hair replacement ways to conquer baldness. In women baldness can cause due to a lot of reasons like aging, genetic influence and hormonal change. The women pattern baldness is not as extreme as compared to their matching part; though the hair tend to become extremely thin In general, baldness in women happens when their hair follicle shrinks after a certain period, resulting in finer hair and shorter. You can get hair transplants and hair loss treatments from a specialized UK hair transplant Nu Hair Clinic is part of the renowned hair treatment group. Selecting Nu Hair Clinic means selecting a group that you can have faith for your hair treatment. Loss of hair has become a ordinary problem for men in the entire world irrespective of any age of the people. More than 50% of men goes through some type of hair loss till the age of 50. However, for a lot of men, this procedure begins from the age of 20’s and 30’s. Hair loss extensively changes the look of the face, often making them look older than what they actually look. For few men, hair loss can cause major psychological and emotional distress while for others they will find a huge problem. Hair Loss Treatment UK provides a variety of permanent surgical resolution to hair loss. At Nu, the customers desires and needs are always at the front position of the minds and the company thinks in being obvious, clear, honest and open. Every person deserve to feel best about himself and so for your entire peace of mind, the company now includes lifetime Aftercare plan – presenting free aftercare. The company has renowned surgeons who are skilled and have got years of experience. furthermore, your situation is taken care by doctor and expert hair who understands what will be the best for you. 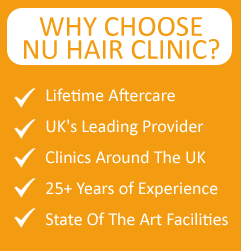 The surgeons at Nu Hair Clinic will provide you an exceptional client service from enquiry to excellent aftercare. Nu Hair Clinic has offers the best hair loss treatments at our clinics in Leeds, Liverpool, London, Manchester, Newcastle, Nottingham and Sheffield. Visit our clinics page for more information.